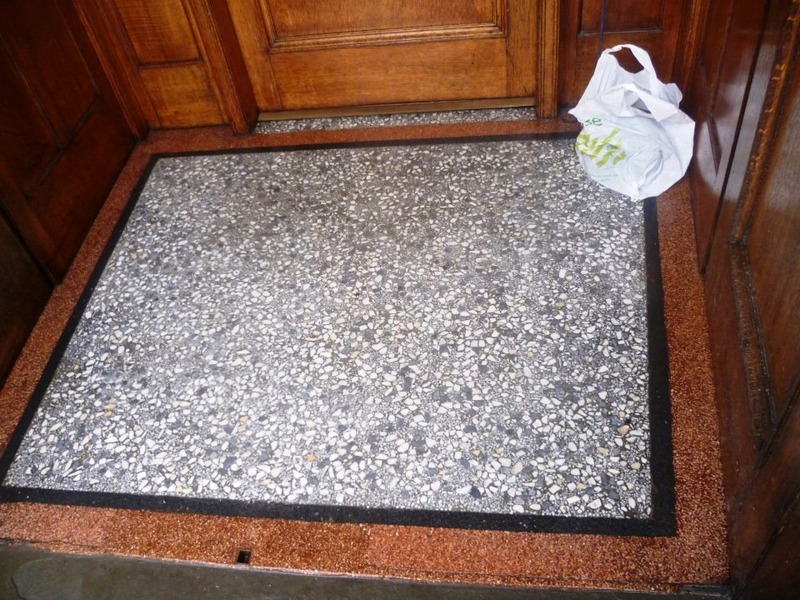 Just to prove we take on any job large or small I thought I would post the details of this small Terrazzo Vestibule that we recently cleaned at the entrance to a house in Glasgow. The Terrazzo was not looking its best which is hardly surprising being in front of the main entrance to the house it must have seen a lot of foot traffic over the years. Terrazzo is a very hard surface and as a result it has to be treated in the same way as other hard surfaces such as Travertine, Limestone and Marble which typically involve burnishing the surface to remove the dirt and restore the appearance. Before burnishing the floor was cleaned using a strong dilution of Tile Doctor Pro-Clean which was left to dwell on the Terrazzo for a while before being scrubbed in by hand due to it being such a small area; following that the floor was given a quick rinse with water and a quick clean with Tile Doctor Neutral Cleaner to remove any trace of strong cleaning product. 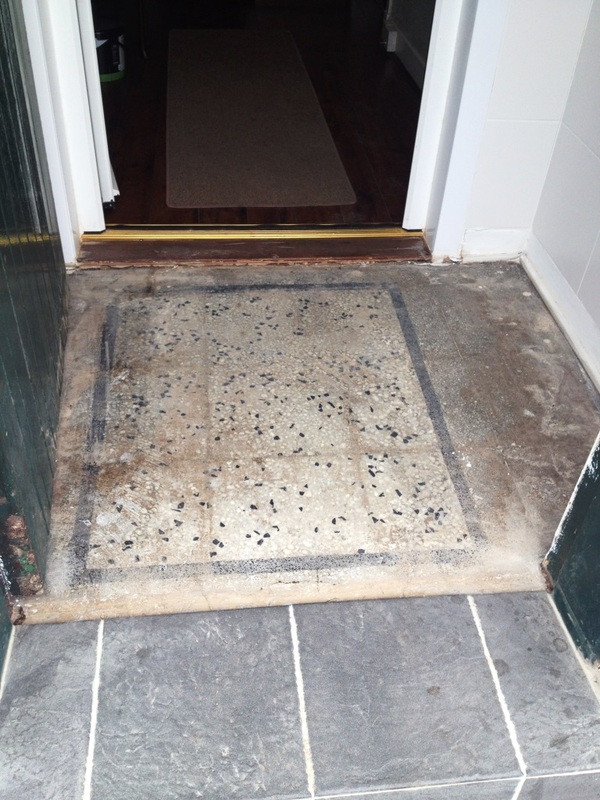 The next step was to burnish the floor using a set of four diamond encrusted burnishing pads. You start with a coarse 400 grit burnishing pad which is run over the surface with a little water to help lubricate and this removes surface dirt and coatings such as sealers. Once that was finished we moved onto the medium 800 grit pad which is the first step of the polishing process and also removes ingrained dirt. The surface of the Terrazzo is still quite rough at this stage so once complete with the medium pad the fine (1,500 grit) is used smooth down the surface and continue to build up the polish in the floor. The last pad is a very fine (3,000 grit pad) and this pad builds on the existing polished effect to create a high shine finish. All these pads are applied with water and the resultant slurry needs to be cleaned off during the process with the final step of giving the floor a thorough rinse with clean water. Once the floor was completely dry it was sealed using two coats of Tile Doctor Colour Grow which is an impregnating sealer designed to bring out the natural colours in the stone and penetrate into the pores of the tile preventing dirt from getting in there and providing maximum on-going stain protection. The floor was then buffed using a white buffing pad to bring up the shine further and remove any smears left from sealing. 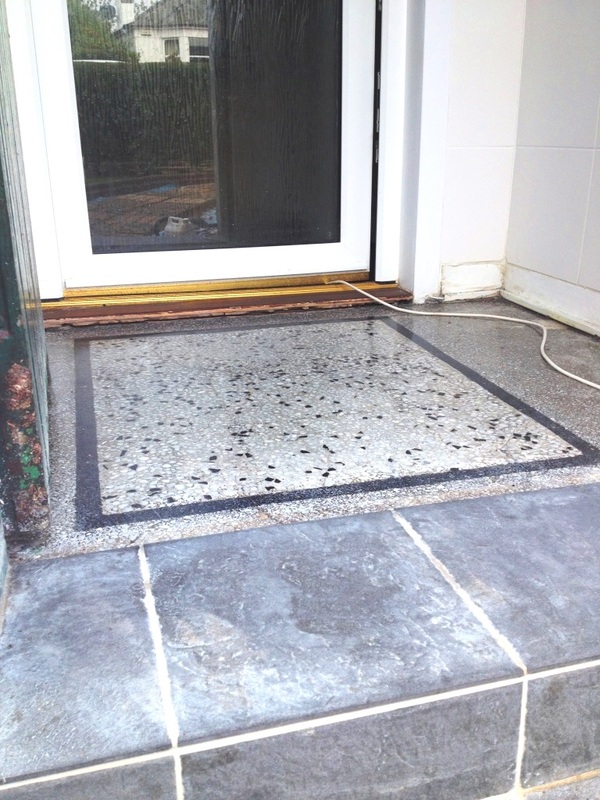 This Terrazzo tiled vestibule in Glasgow was completely dull and lacking colour when we arrived, this area probably see’s the most foot traffic in the house so it must of seen a fair amount of wear and abuse over the years. 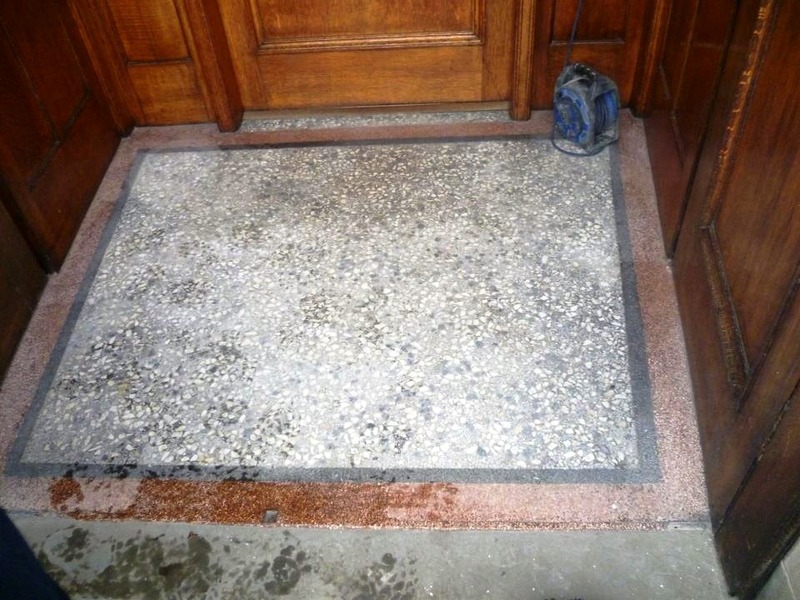 Terrazzo is a very hard surface and needs to be burnished in the same way as you would treat Marble or Travertine, before we could do that thought we needed to remove any loose debris etc. that could scratch the surface during the burnishing process to the first job was to sweep out the area with a brush and vacuum up any loose debris etc. It was a very tight area so use of our large Bonnet machine was ruled out and we opted instead for a small handheld rotary machine fitted with the diamond encrusted burnishing pads. The burnishing pads come in a set of four and you start with a coarse pad with a little water and work your way through the set moving from a the coarse pads through to the less abrasive pads; this process polishes the stone more and more until you get a smooth finish. After each pad was used the area was thoroughly rinsed with clean water to remove any excess polish before moving onto the next, once we had gone through all four pads the floor was left clean ,smooth, and shiny. Once the burnishing process was completed we proceeded to seal the stone with two coats of Tile Doctor Colour Grow which is a colour enhancing sealer designed to protect the stone whilst lifting the natural colours. Although quite intensive due to the space restriction it was quite a small area so it took just less than a day to complete.